A friend asked me to make a pair of tiny socks in the Glasgow Rangers Football (soccer) colors. I asked very carefully just what the colors were. Black with a red turn over I was told. 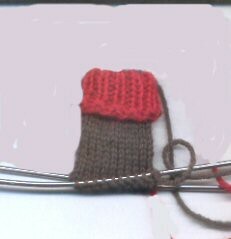 So I cast on for the cuff in red and this morning I considered just how a big a cuff would be needed. Google, no close up sock pictures. 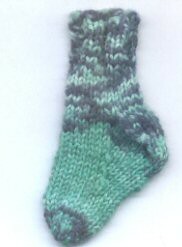 I proceeded to knit a cuff long enough to fold over and moved on the the leg of the sock. On nailing down my friend I was told "Ah well they just have a small strip this season" gaaaaahhhhhh Men! The second is a St Patricks day pin for my daughter. Some old Opal. I now remember why the original socks never got finished. Every so often there were long stretches of white yarn. The pattern didn't continue. Opal can do things to me that make me want to bang my head against a wall. Sort of like a 3yr old asking "Why" over and over.